Despite the disappointing endorsement by the LGBT Victory Fund the Boston Globe is reporting gay GOP HonoCON Richard Tisei has been defeated by LGBT straight ally and top progressive incumbant Democrat John F. Tierney for the House seat from Massachusetts last night. …With all precincts reporting, Tierney held a nearly 4,000-vote lead, collecting 48.3 percent to Tisei’s 47.3 percent. But Tisei in typical GOP homoCON crybaby fashion is not willing to concede the race at this point and is screaming about allegations of voter fraud and calling for an investigation. Tisei team is testing the truth of Tierney’s win. Tisei’s campaign manager, Paul Moore, said he wasn’t able to speak to the town clerk of Lynn and believes there may have been foul play. “I think at best we have a very incompetent official in Lynn…,” Moore said. Tisei needs to face the fact that he lost the Lynn vote by 3:1 because he would have caucused with the GOP and Tea Partiers and supported their policies, not the pro immigration reform, pro affordable health care and pro blue-collar positions Lynn residents desperately care about. John Tierney on the other hand has been a stalwart defender of the Democratic and progressive movement and LGBT rights. 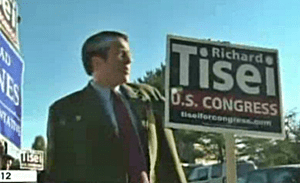 Tisei would have hurt Massachusetts and the LGBT Community and helped empower a party that’s inhospitable to gay rights. As for the Victory Fund they should be deeply ashamed for ever endorsing Richard Tisei and should no longer receive donations from the LGBt community until they adopt a pro LGBT equality mission statement before their current pro LGBT candidate mission statement. Vanity Fair Publishes “Red Meat” The GOP Beefcake Calendar – OMG MY EYES!